The Audi RS 5 TDI concept (shown) has an electrically driven compressor from Valeo (see red area of inset) that when combined with a 48-volt system can push rpms to 72,000 within 200 milliseconds. Audi will be the first automaker to use electrically boosted turbocharging in a mass-production model starting next year. Other companies looking seriously at this emerging technology include Ford Motor and Honda. The trend toward electrifying turbos is expected to benefit Valeo, which will supply Audi with its electric supercharger, as well as Honeywell and BorgWarner. Electrically driven compressors push air toward a standard turbocharger from very low revolutions, which reduces traditional turbo lag while increasing power and decreasing fuel consumption. BMW, however, is less keen on the technology as it and some other brands argue that regular turbo technology works just as well. Even turbo specialists such as Honeywell acknowledge that electrified turbos will probably require a move to pricier 48-volt vehicle architectures from today’s conventional 12-volt solutions to get the maximum benefits. Electrifying the turbocharger “is a very important future technology,” Audi r&d boss Ulrich Hackenberg told Automotive News Europe. He said the first Audi to use an e-charger would be a version of the new Audi Q7 flagship SUV. It’s likely to be badged the SQ7. 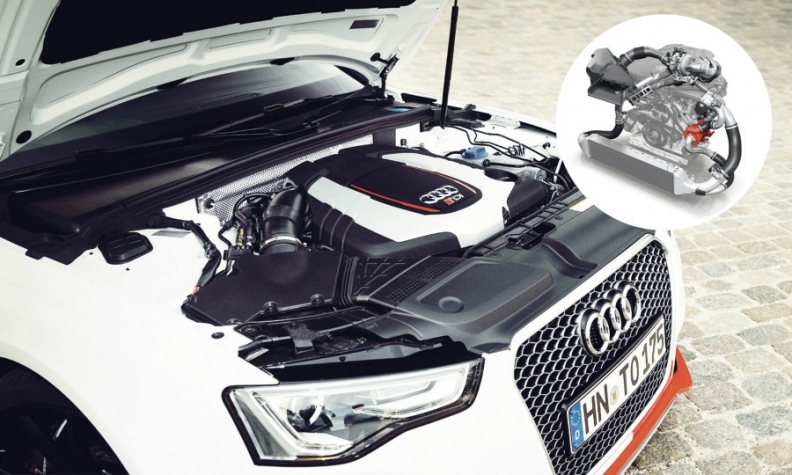 Speaking at Audi’s annual press conference in March, Hackenberg said: “We will equip TDI [diesel] engines as standard with an electrically driven compressor.” He didn’t provide a timeframe for the rollout of the technology. Audi demonstrated the technology last year on the RS 5 TDI concept. The result was that power from a standard 3.0-liter V-6 diesel rose to 385 hp from 313 hp. Audi says the technology also would work on gasoline engines. Ford has looked at applying the technology to gasoline engines. The automaker recently conducted a project using an electrically driven compressor to increase the power of its 1.0-liter three-cylinder EcoBoost engine to 156hp from a previous high of 125hp. Valeo says other automakers likely will follow Audi in using its electric supercharger. Valeo Chief Operating Officer Christophe Perillat-Piratoine told Automotive News Europe that the French supplier believes it has a one- to two-year lead over rivals. Honeywell expects to have its version of the system on the market between 2017 and 2019. Gavin Donkin, Honeywell Turbo Technologies vice president for product development, said that because e-chargers use an electric motor to drive a separate compressor the system is not held back by the physics of exhaust gases. The result is very little turbo lag at low engine speed. The challenge is marrying the e-compressor with the turbo. “It becomes quite complex and costly to make sure the two machines are working in tandem,” Donkin said. The wider problem is that e-chargers and e-turbos need significant electric power. That could require automakers to switch to a 48-volt architecture. Audi’s Hackenberg said that a 48-volt system is needed to supply the 7 to 8 kilowatt of power needed. He declined to confirm whether the forthcoming Q7 fitted with the electrically driven compressor will have such a system. The problem is that 48-volt systems currently are only viable if there are more electrical components running on the network. Honda, Ford and BMW executives told Automotive News Europe that 48-volt architectures are too costly right now.